Schumann's porcelain salad plate, scalloped with gold trim. Porcelain small teacup and saucer by Hertel Jacob, US ZONE. Dresden Semi porcelain gravy boat, Rococco style. Vintage porcelain shakers set with heavy gold ton top decor marked JR Bavaria in a circle. Campbell's soup cups with nurses, doctors, police officers, firefighters from 1997. Salad Plate in Racine (All White) by Hutschenreuther, Bavaria. German porcelain pitcher or ewer in mint green color with rose decor by IMPERIAL, PP. Vintage Wheat N Daisy JAGN creamer in elegant design with gold trims Bavaria made in Germany. Vintage Wheat N Daisy JAGN lidded sugar bowl in elegant design with gold trims Bavaria made in Germany. Vintage Wheat N Daisy JAGN large round serving bowl in elegant design with gold trims Bavaria made in Germany. Vintage German porcelain shakers Delphi bottles with original corks. Ohme, Hermann, porcelain lidded sugar bowl, Old Ivory. Favorite Bavaria C. Hutschenreuther antique large creamer with floral border and heavy gold decor, circa 1916. Vintage Wheat N Daisy JAGN 13" long oval serving plate in elegant design with gold trims Bavaria made in Germany. Hand painted fruit decorated two plates from Bavaria with berries and cherries accented with gilded wavy rims. Antique Jaeger J&C Bavaria Louise pattern lidded vegetable or berry dish. Vintage Wheat N Daisy JAGN 16" long oval serving plate in elegant design with gold trims Bavaria made in Germany. Antique Oscar & Edgar Gutherz O&EG Royal porcelain pedestal dessert server in fruit theme cherries design made in Austria and sign E. St Peters. Antique Oscar & Edgar Gutherz O&EG Royal porcelain pedestal dessert server in fruit theme grapes design made in Austria and sign E. St Peters. Antique Oscar & Edgar Gutherz O&EG Royal porcelain pedestal dessert server in fruit theme Blueberries design made in Austria and sign E. St Peters. Antique Oscar & Edgar Gutherz O&EG Royal porcelain pedestal dessert server in fruit theme Blackberries design made in Austria and sign E. St Peters. Antique Thomas, Thu.E Mr, Bavarian porcelain lidded sugar bowl. 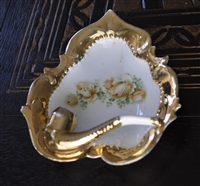 Three Crown China Germany deep ornate serving bowl with floral decor and embossed gold rim. Antique beautiful European porcelain sugar and creamer set, Irises and gold trims.